I paddle on a dragon boat team with an amazing group of people. I’ve been with the Team Lifescan for 10+ years and over that time we’ve gone from a team that placed as one of the bottom of a 100+ recreational teams to a higher ranking competitive team. Through the years not only has our paddling improved, but our food has as well. It’s not like we ever ate poorly, because as a team we’ve always been taken care of. But in the past few years, under the care of our “Team Chef” we have taken the team eating thing to a new level. Shirley Park is an amazing cook and the thought and heart she puts into feeding our team is unbelievable. Most teams get cold cuts or Costco lasagna on race day. Team Lifescan gets a taco station with all the fixings and everything is made from scratch, even the veggie dips! 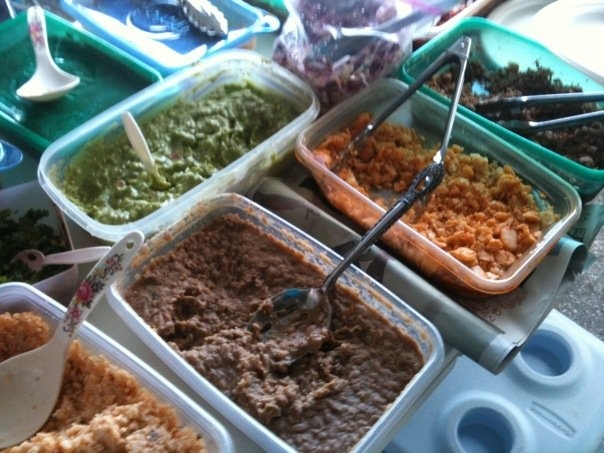 For a race day lunch we were served tacos with our choice of fish or carne asada, guacamole, salsa, rice refried beans. All were made from scratch the night before the festival. To top it off, there were even nopales! Who but Shirley would include nopales as a choice to put on our tacos? So it was with eager anticipation this evening when we organized our first apres-practice tailgate of the season. I feel bad, because I say, “we organized” but it was more like we picked a date and then put Shirley to work to plan and prep so that she could quickly feed our hungry stomachs after a hard practice. As usual, her menu did not disappoint! When other teams tailgate, I’m sure they just slap some dogs or burgers on the grill and put out the standard 3 pack of condiments. 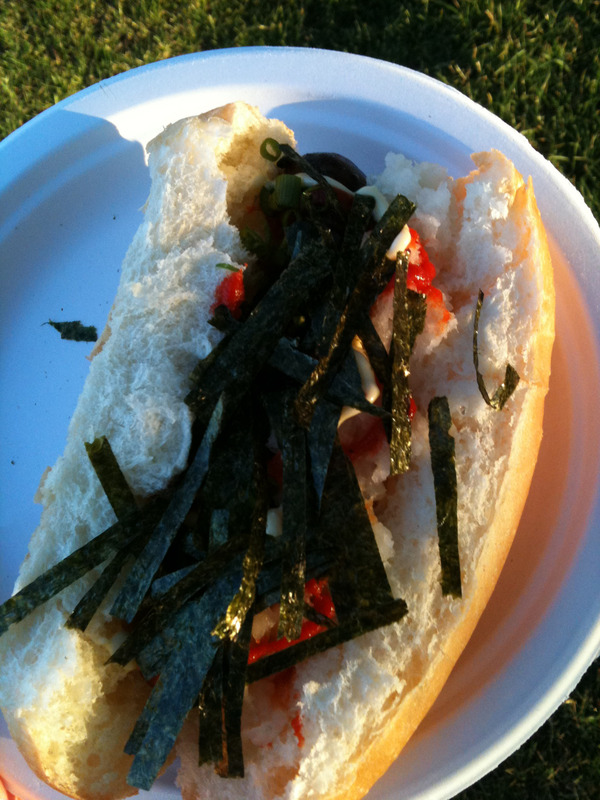 When Team Lifescan tailgates, we get Japadogs! But these were so much better than the original, (a post on that will follow shortly). These dogs were bacon wrapped, fired on the grill and we were left to add our own toppings. Mine included grated daikon, sriracha sauce, teriyaki sauce and wasabi mayo(homemade probably) and to top it off, nori(seaweed)! I was pretty hungry when I put this together, and goofed by putting the nori on last so the photo doesn’t do this wonderful meal justice. We're going to have to have another tailgate soon so I can have a do-over on this photo. It was an amazing evening to be in Vancouver with the sun setting, enjoying fantastic food with fabulous friends. 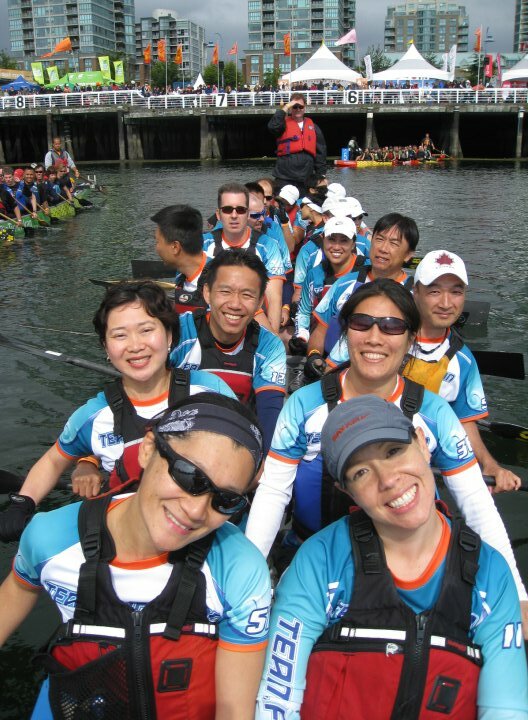 Next stop for Team Lifescan is the Victoria Dragon Boat festival and LOBSTER! We're looking pretty happy here because for the first time ever, Team Lifescan ranked high enough in the Rio Tinto festival to participate in a special 2000m race. Mmmm and the best thing about these i’m sure was no waiting in line down on Burrard Street! That and I got to enjoy it sitting on the grass watching the sunset!